WASHINGTON — The United States will pull out of a landmark global coalition meant to curb emissions that cause climate change, President Donald Trump announced Thursday. "The United States will withdraw from the Paris climate accord," Trump said to applause from the crowd gathered in the White House Rose Garden. He added that the U.S. will begin negotiations to re-enter either the Paris accord or a new treaty on terms that are better for American businesses and taxpayers. "So we’re getting out, but we will start to negotiate and we will see if we can make a deal that’s fair," he said. Vice President Mike Pence praised Trump for keeping his campaign promises and abiding by his "America First" mantra. In talking points obtained by NBC News just before Trump's announcement, the White House argued the agreement was "negotiated poorly" and was too costly for the American people with few tangible gains. The long-awaited decision came as little surprise, with multiple administration officials telling NBC News earlier in the week that the president was leaning toward leaving the signature 2015 agreement that nearly every other country on Earth has embraced. Still, the decision is a blow to environmentalists, business leaders and international figures, many of whom have urged Trump to reconsider. The U.S. now joins Syria, which has been mired in a war and Nicaragua, which has said it didn't join because they didn't think the climate agreement went far enough, in not taking part in the global agreement. President Trump said the other 195 countries in the agreement “went wild, they were so happy" that the U.S. initially joined the accord "for the simple reason that it put our country, the United States of America which we all love, in a very, very big economic disadvantage." The Paris Agreement — which was brokered in 2015 and took effect in November 2016 — seeks to prevent increases in global temperatures by gradually reducing man-made emissions that science has shown causes rising temperatures. The accord sets as a specific goal keeping the Earth from warming by more than 3.6 degrees Fahrenheit — or 2 degrees Celsius. While former President Barack Obama committed the U.S. to the agreement, it is a voluntary national pledge — not a binding treaty. Obama pledged a lowering of American emissions by 26 to 28 percent by 2025, as well as $3 billion to the United Nations Green Climate Fund, but Congress' most recent spending deal leaves out those funding dollars. On Thursday, Obama said it is now up to states and cities to step up to help pave a low-carbon future. "The nations that remain in the Paris Agreement will be the nations that reap the benefits in jobs and industries created," Obama said in a statement. "I believe the United States of America should be at the front of the pack. But even in the absence of American leadership; even as this Administration joins a small handful of nations that reject the future; I’m confident that our states, cities, and businesses will step up and do even more to lead the way, and help protect for future generations the one planet we’ve got." The European Unionsounded a similar note and pledged that "The Paris Agreement will endure. The world can continue to count on Europe for global leadership in the fight against climate change." The U.N Secretary General's office issued a statement that called the decision "a major disappointment for global efforts to reduce greenhouse gas emissions and promote global security". Trump campaigned on stopping funding to the United Nations Green Climate Fund, and has taken multiple steps to dismantle the Obama administration's legacy on climate change — including rolling back domestic legislation like the Clean Power Plan, which sought to reduce carbon pollution from power plants. During the president's first international trip last week, world leaders — including the Pope — urged him to remain in the accord. Republicans have also spoken in favor of the climate accord, including former GOP presidential candidate Mitt Romney who tweeted his perspective Wednesday night. Trump on Thursday said the other nations urging the U.S. to remain a partner in the climate fight wanted to ensure "we continue to suffer the self inflicted major economic wound." The reality, Trump said, is that withdrawing is both "in America's economic interest and won't matter much to the climate." He added that his administration "will continue to be the cleanest and most environmentally friendly country on Earth." Technically the U.S. can't officially withdraw from the agreement until November 2019 — though it's possible to expedite that process by abandoning a related Senate-approved climate measure linked to the Paris accord. Celebrities, environmental groups and American business leaders have also made public pleas and overtures to President Trump, among them Elon Musk of Tesla, Apple's Tim Cook, and Dow Chemical CEO Andrew Liveris. Musk vowed to leave presidential advisory council roles as a result of Trump's decision. "Science Guy" and CEO of the Planetary Society, Bill Nye, told MSNBC Thursday "you can't build a border wall against carbon dioxide emissions. No, the time to get to work on this is right now." Former Vice President Al Gore, who was jointly awarded the Nobel Peace Prize to Intergovernmental Panel on Climate Change for efforts to educate about global warming, called Trump's decision "a reckless and indefensible action". Former Secretary of State John Kerry called the move an "abdication" of leadership and "self destructive". "He gave America a huge fake news moment in which he pretended that certain things are happening that aren't," Kerry said in an interview with NBC News' Andrea Mitchell. Meanwhile, Republicans applauded Trump's decision as one that brings the focus back to a policy that better supports the American economy. In statements on Thursday, House Speaker Paul Ryan called the agreement a "raw deal for America" and Senate Majority Leader Mitch McConnell lauded Trump for "dealing yet another significant blow to the Obama Administration’s assault on domestic energy production and jobs." Trump previously called global warming a "hoax" and White House Press Secretary Sean Spicer was unable to answer Tuesday whether or not Trump believes scientific evidence that human activity is contributing to climate change. "Honestly, I haven't asked him," Spicer said. As a candidate, Trump repeatedly lambasted his predecessor for the focus placed on combating climate change, laughing off the Obama statement that climate change is the biggest threat the planet currently faces. As president he nominated Scott Pruitt to the EPA Administrator post — someone who in the past expressed doubts about climate change's origins and in March questioned whether carbon dioxide primarily contributes to global warming. Pruitt praised Trump's decision and assumed the podium immediately after Trump to laud the choice. In a briefing following Trump's announcement, administration officials repeatedly sidestepped questions about if the president believes in climate change. That the president wants to try to renegotiate the deal "speaks for itself," said one White House official, who spoke with reporters on condition of anonymity. Asked what a better deal might look like, the officials were vague on specifics, deferred to the president and said that the details of a better deal are up to Trump. Environmental groups roundly criticized the president's decision. 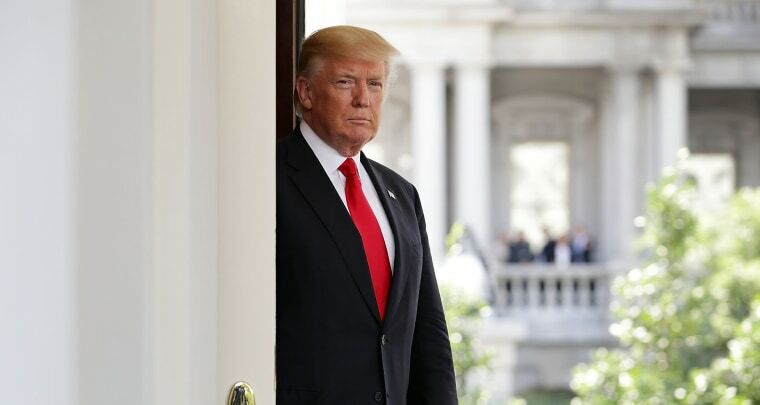 "Generations from now, Americans will look back at Donald Trump’s decision to leave the Paris Agreement as one of the most ignorant and dangerous actions ever taken by any President," Sierra Club executive director Michael Brune said in a statement. "Trump is betraying the country, in the service of Breitbart fake news, the shameless fossil fuel industry, and the Koch brothers’ climate denial operation. It’s sad," said Sen. Sheldon Whitehouse, D-Rhode Island, a member of the Senate Environment and Public Works Committee and co-chairman of the Senate Climate Action Task Force, in a statement.